A tweet advertising my afternoon poster presentation… retweeted by AGU! Thursday was my final day at the AGU Fall Meeting, and it was just as busy and packed full of new information, great discussions, and my own poster presentation. After setting up my poster in the Poster Hall before 8AM, I weaved up and down the aisles to see some other posters and talk with presenters. 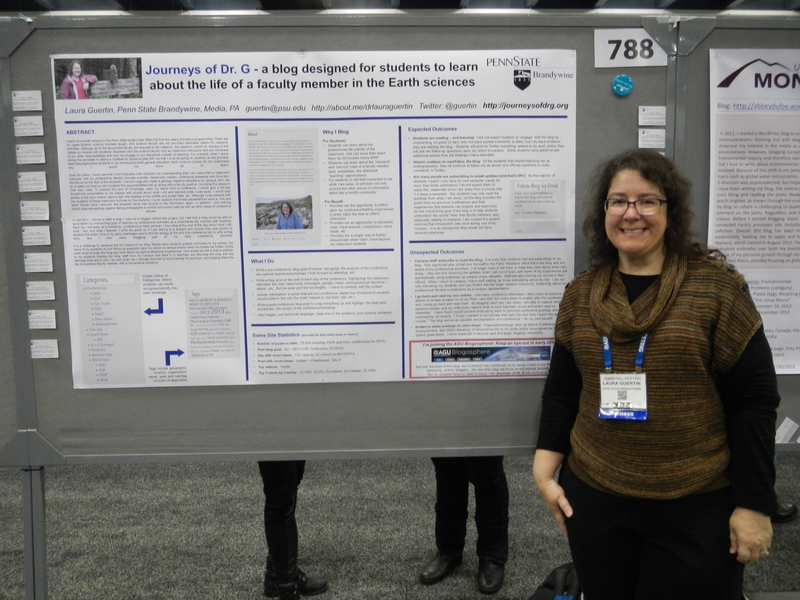 The two posters I spent the most time at were presented by a high school teacher I know that does research with another Penn State faculty member but also works with me on the monthly eNewsletter for the Pennsylvania Earth Science Teachers Association (PAESTA). Greg Collins presented on “Reduced Aftershock Productivity in Regions with Known Slow Slip Events” – pretty impressive research! I also swung by a poster by Molly Witter, an undergraduate student in the Geoscience Department at Penn State University that was presenting on her REU project from this past summer in Arizona, titled “Origin of the “dike-like” structure and transitions in eruptive styles at Colton Crater, northern Arizona: San Francisco Volcanic Field REU.” I also interviewed Molly for a podcast I am pulling together for the Geoscience Department, so we can document her undergraduate research experiences for future student researchers to learn from. I then zipped over to the Exhibit Hall to watch a presentation on NASA’s Hyperwall about the My NASA Data Live Access Server. I was fascinated by the NASA visualizations displaying on the huge screen, and then I found out how myself and my students can easily access NASA datasets for our own explorations – something I certainly want to include in my future courses! The rest of the morning I spent in the session on “Scientists Must Film! Using Video to Enhance and Expand Science, and Science Communication.” I’m spending a lot of time this year learning about best practices for communicating science, and the session was filled with examples from a range of existing projects. I learned about virtual poster sessions for students, using WebTV for community engagement (by the Arizona Geological Survey), the Direct Measurement Video Library to teach physics, and student-led public engagement through video diaries on Facebook. The most interesting talk I heard was by the company Skypunch Creative, who works with scientists to document fieldwork with audio and video. They have written a guide for shooting video in the field for scientists that I am definitely going to check out (and I’m sure would be helpful for students as well!). During lunch, I headed over to a talk on “Geoscience MOOCs: Do they work, and are they worth it?” (click here to learn more about a MOOC, and see what the New York Times had to say about them just a few days ago) The two session leaders were from the University of Illinois, where one currently teachers a MOOC and one has a MOOC currently under development. Many of the facts shared during this session were not new to me – MOOCs take years to develop, can cost anywhere from $15,000 to $50,000 to build, and the drop-out rate is significant (for example, a MOOC that starts with ~10,000 people enrolled might only have 100 people finish). What surprised me was the demographic of participants in MOOCs – the average age is in the late 30’s, over half enrolled are women, and 75% of the participants already have a bachelors degree. The session then turned in to a discussion about the differences between a traditional online course versus the MOOC format of delivery, how the best way for students to learn is from one-on-one tutoring (which is exactly the opposite of a MOOC format, but also not what we do in the classroom), and that with all of the frequent advances and discoveries in the geosciences, a MOOC may become outdated in just a couple of years. We also had many questions as a group – how do we replace examining hand samples and fieldwork in a MOOC? How do we promote critical thinking when everything has to be automatically graded? And if people taking MOOCs already have degrees, then do MOOCs need to be designed/delivered differently? The take-home message was that “the future is about student motivation” – something all faculty and students struggle with in all teaching/learning environments. Finally, 1:40PM came, and it was time to present my poster! (you can read my abstract and see my poster on ScholarSphere) The afternoon poster session ran from 1:40PM to 6PM, and I stayed at my poster the entire time (we are only required to be at our posters for two hours, but by standing at my poster the entire time, I get to have the most interactions with the largest number of people). I had some great conversations with many people – some just thinking about blogging, to others that already have their own blog and were looking to exchange “tips and tricks” for an effective blog. Some visitors exchanged URLs with me to their blogs, and I can’t wait to check out some blogs such as Bogology (a blog about the science of peatlands and past climate change). It was a long time to stand (yes, no sitting allowed!) and converse with people, but what a great poster session, and I’m so glad I was able to share it with one of my former students, Abbey Dufoe, who was presenting next to me about her blog on Environmental Explorations. Survived my #AGU13 talk! But did the audience? I took pages and pages of notes, created many blog posts, and I think it will still take me a few more days to process everything and reflect upon what I have learned from this conference. Hopefully, I can effectively translate my experiences to student learning opportunities back in the classroom!